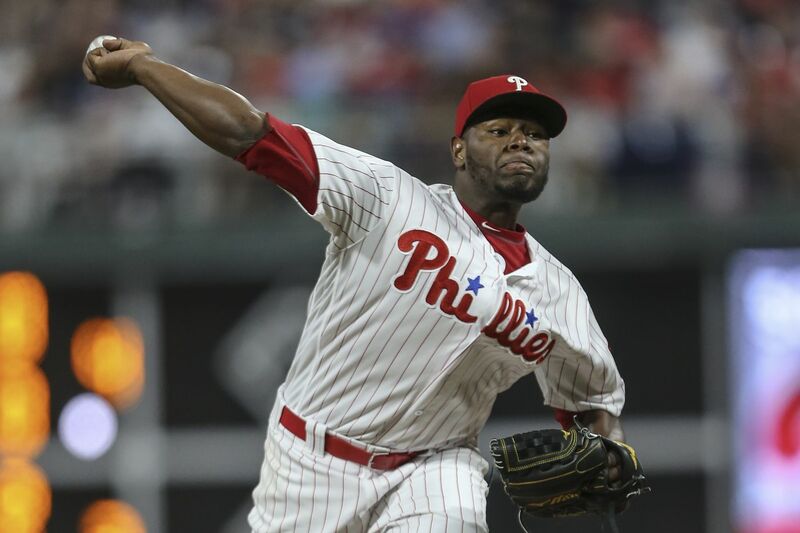 Phillies' pitcher Hector Neris throws against the Yankees during the 7th inning at Citizens Bank Park in Philadelphia, Monday, June 25, 2018. Yankees beat the Phillies 4-2. Hector Neris' weeklong stint in triple-A was his first trip to the minor leagues in three years. The righthanded reliever carved a role with the Phillies thanks to a devastating splitter, but he was back in the minors after everything seemed to fall apart. He pitched just two times for the IronPigs, but his mind was not in Allentown or Scranton. Neris still believed he could pitch in the majors, so his focus stayed in Philadelphia. "You have to have your mind here. Triple A is the minor leagues," Neris said. "If you want to be here, you have to think about here." Neris returned Monday from the minors and joined the Phillies with a sense of confidence. Manager Gabe Kapler said he saw Neris "bouncing around the clubhouse" in the afternoon and could tell the pitcher was eager for a fresh start. The manager wasted little time using him as he deployed Neris in the seventh inning of a two-run game. He retired the three Yankees he faced — two on strikeouts — and his splitter looked effective again. On Tuesday, he pitched a perfect ninth inning, with strikeouts of Aaron Judge and Giancarlo Stanton. "It's one outing, but it's definitely encouraging," Kapler said of Monday's appearance. "We've seen him come out at times with a devastating split, but [Monday] night he threw two or three that I thought were exceptional. It feels good. There's a lot of confidence and a lot of enthusiasm and thoughts that things might really work out well here for Hector and for us." Neris worked in triple-A with IronPigs pitching coach Dave Lundquist, who helped the pitcher revive his splitter. He told Neris to relax and to throw with his arm, not his body. They refined his throwing motion, giving Neris a more fluid delivery to the plate. The splitter was the pitch that helped Neris emerge over the last two seasons as a reliable bullpen piece. Opponents batted just .158 against the splitter in 2016 and .179 in 2017. They were batting .213 against it this season when Neris was sent down. The slugging percentage against the splitter when Neris was demoted — .360 — was nearly 100 points higher than last season's mark. The Phillies' bullpen has been shaky and is shorthanded, with Pat Neshek, Luis Garcia, and Edubray Ramos on the disabled list. Neris, if his splitter returns to form, will be a welcomed addition. "I'm back to my routine and back to everything," Neris said. "I came back here stronger to help my team in October." Luis Garcia (strained wrist) is eligible to return from the disabled list but has yet to throw off the mound. … Pat Neshek (strained forearm) made a rehab appearance with double-A Reading. … Zach Eflin will start Wednesday's series finale against Yankees righthander Luis Cessa.